For all commonly used routes of administration except IV, the drug must dissolve in body fluids and diffuse through one or more membranes to enter the blood or plasma. Thus, all routes except IV are classed as extravascular routes, and absorption is defined as appearance of the drug in blood or plasma. The most common extravascular route is oral. 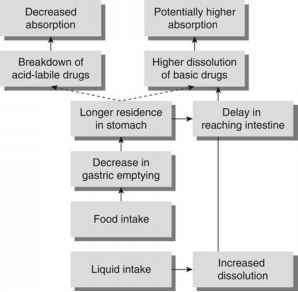 When a solution or a rapidly dissolving solid dosage form is given orally, the absorption process often obeys first-order kinetics. In these cases, absorption can be characterized by evaluating the absorption rate constant, ka, using plasma concentration versus time data. where DG = drug at the absorption site (gut); DB = drug in the body; DE = eliminated drug; ka = first-order absorption rate constant, and kel = overall elimination rate constant. Figure 8 Semilogarithmic plot of observed plasma concentrations (crosses) and "residuals" (circles) versus time for an orally administered drug absorbed by a first-order process. Equation (35) describes the line in Figure 8, which is a semilogarithmic plot of Cp versus time for an orally administered drug absorbed by a first-order process. The plot begins as a rising curve and becomes a straight line with a negative slope after six hours. This behavior is the result of the biexponential nature of equation (35). 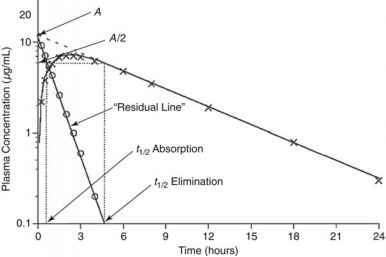 Up to six hours, both the absorption process [exp (-kat)] and the elimination process [exp (-kelt)] influence the plasma concentration. After six hours, only the elimination process influences the plasma concentration. where A is a constant term. Thus after six hours the semilogarithmic plot of Cp versus time shown in Figure 8 becomes a straight line, and kel can be determined from the slope. Therefore, the overall elimination rate constant for a drug may be accurately determined from the "tail" of a semilogarithmic plot of plasma concentration versus time following extravascular administration if ka is at least five times larger than kel. As shown in Figure 8, a semilogarithmic plot of residuals versus time is a straight line with a slope of —ka. A is a function of the two rate constants (ka and kel), the apparent volume of distribution (Vd), and the amount of drug absorbed (DG). After ka and kel have been evaluated and A has been determined by extrapolation, a value for Vd can be calculated if it is assumed that DG is equal to the dose administered, i.e., absorption is 100% complete. Example. Figure 8 is a plot of the data shown in Table 5. The extrapolated value of A is 11.8 mg/mL.